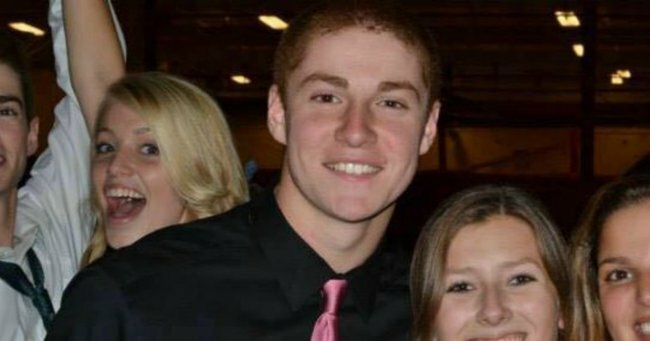 Penn State frat death: 18 brothers charged over 19-year-old's death. Group of college students charged for horrific 'hazing' ritual that killed 19-year-old. Three months after a 19-year-old college sophomore died after falling down the stairs of his frat house during a pledge ceremony, 18 members of his fraternity have been charged in relation to his death. Timothy Piazza, a student at Pennsylvania State University, died on February 4 this year when a hazing ritual saw him have a series of falls after consuming a “fatal amount of alcohol”. On Friday, Centre County District Attorney Stacy Parks Miller announced the results of a grand jury investigation into Piazza’s death. Parks Miller said 18 members of his fraternity have been charged as well the fraternity itself, with eight facing charges of involuntary manslaughter. In a press conference, Parks Miller said on the night of his death, Piazza was attending a “bid acceptance night” and the fraternity had a night set up for him called “a gauntlet”. After consuming a “fatal amount of alcohol”, the grand jury found Piazza fell down a set of stairs within the house. A doctor calculated that Piazza’s blood alcohol content at this time was between .28 and .36 percent. In America, the legal limit for driving while intoxicated is .08 percent. Parks Miller says this fall rendered Piazza “essentially like a toddler”, with the 19-year-old engineering major experiencing visible injuries to his head and stomach. Video footage inside the house captured four brothers carrying his limp body to a couch, pouring liquid on him and slapping him. As the night progressed, Piazza fell more times – at least once off the couch and another down the stairs. At one point, one fraternity brother tackled another, landing on top of Piazza. At another, fraternity members put a backpack containing textbooks on him so he would not suffocate on his own vomit. The report also details how when a fraternity brother insisted Piazza needed medical help, he was shoved into a wall. When the same person voiced his concern for Piazza’s state again – and insisted Piazza required help – the jury said he was told members of the group were biology and kinesiology majors so his opinion wasn’t as valuable. In a separate fall, one fraternity member saw Piazza roll off the couch and land on the floor. In response, he took a video of the 19-year-old and uploaded it to Snapchat. By the time fraternity members stumbled upon the boy in the morning he was in “dire need of help”, and yet, Parks Miller says they waited more than 40 minutes to call for it. Instead, they Googled things like “what to do with a head injury”. When they finally did call for help, they did not mention Piazza had fallen. By the time Piazza had reached the hospital, he had “irreversible” brain injuries, and was later pronounced dead. The grand jury concluded that members of the fraternity actively tried to conceal evidence of the hazing and underage drinking. In a deleted text that was recovered, one man wrote, “If need be, just tell them what I told you guys, found him behind [a bar] the next morning at around 10am, and he was freezing-cold, but we decided to call 911 instantly, because the kid’s health was paramount”. Addressing the press conference, the student’s father, Jim Piazza, said his son was an “incredible young man and an excellent student”. My Central Jersey have published the full grand jury report here.